* How to find out who else is going * What sort of questions to ask suppliers * How to tell if a seminar is likely to be any good. In total, there are over 200 hints and tips and other bits of information. I was never any good at mathematics in school, but since this guide is free, I think that makes each tip have a value of infinity. In other words, this is an infinitely valuable booklet, and what’s more it is free! If I have got that completely wrong, then all I can say is be thankful that I am not your child’s maths teacher. 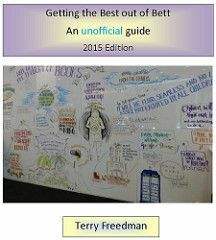 There’s a full list of contents in the blog post Getting the Best out of Bett 2015. If you can’t defer your gratification any longer, then download the guide by clicking the picture below. Feel free to share the link on your own blog or website if you like, or Twitter etc. I hope you find it useful, and enjoyable to read. More than 200 tips, suggestions and other stuff, and completely free! Click on the pic to get it.